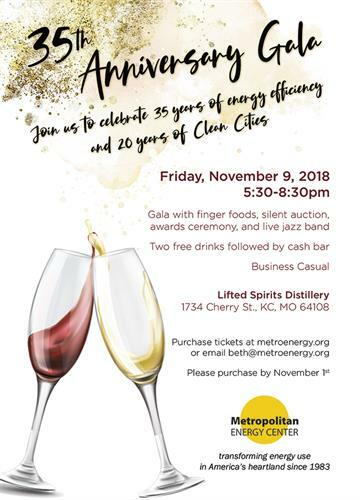 A silent auction with pieces from local artists, restaurants, and energy efficiency professionals. Small plates and platters from Kansas City caterers, including Organic Soul's award winning plant-based "wings", and farm-to-table meatballs, meat and cheese platters, and desserts from The Sundry! Both of these businesses are passionate about ensuring the food is sustainable, ethical, AND delicious! This event will celebrate our accomplishments over the last 35 years, and will also serve as a launchpad to continue the critical environmental programs that keep our community green and livable for generations. We are deeply appreciative for all of those who have made our 35 years a success, and look forward to many more years of energy transformation.